Well, it’s been another glorious summer for dee-Lightful Productions. The kids are back in school, older and wiser, and with a grand sense of their artistic selves. The arts get so little attention these days that anywhere an artistic self gets to perform in front of an appreciative crowd it is an amazing thing. And the crowds these days for dee-Lightful are not small, in fact they are packing them in, in the few nights they have the auditorium, with wonderful performances by little creatures. I don’t think I’ve seen anything like this. And make no mistake about it; dee-Lightful does some wonderful work on stage. Just recently they completed The Music Man by Meredith Wilson and Franklin Lacey and a couple of weeks before that, Disney’s The Little Mermaid Music by Alan Menken, Lyrics by Howard Ashman and Glenn Slater, and Books by Doug Wright. 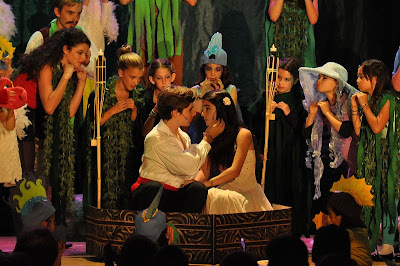 The Music Adapted and Arranged by David Weinstein is based on the Hans Christian Andersen Story and the Disney Film. I remembered looking at the poster for The Little Mermaid in 1997 before it came out. It did not look like your typical Disney fare. There was simplicity in the artwork, not bad, just different. My first impression was that Disney was going in another direction. But the songs were impressive, the characters real and very different, and there was a religious undercurrent swimming around down there. I had a great time watching that film! And I had another great time watching dee-Lightful’s production of Disney The Little Mermaid produced by and directed by Dolores Aguanno at the Veterans’ Memorial Auditorium in Culver City. There was a tremendous effort on stage to get the audience under the sea and on land and this could not have been done with all of the volunteer help that is needed for this production with a cast and crew of thousands (slight exaggeration). Mika Barocio was Pilot. Samuel Petersen did another fine job as Prince Eric and has a very nice voice and a commanding presence. Mika Stambler played Grimsby. Lily Fanali played Ariel and she has a very fine voice and was very sympathetic in the role. Eden Tigay was a very tiny Flounder. Emma deZarn was Sebastian, had a wonderful costume, and danced her way into the hearts and minds of those characters on the stage and the audience as well. Under The Sea was one of my favorite songs. Jessie Grimaldo played Scuttle, Evyn Armstrong was Gull 1, Socorro Park was Gull 2, and Uma Kolesnikow was Gulls 3. Keaton Asma had a commanding presence as King Triton, triton included. The Mersisters were exceptional: Aquata was Eliza Spear, Adrina was Lauren Tishkoff, Arista was Emily Greenstein, Atina was Kyra Lianos, Adella was Shayna Graff, and Allana was Angelina Cicchini. 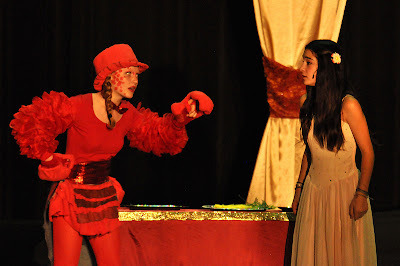 Ursula is a great role and Carly Shiever made the most of it. Shiever wore a wig that enhanced her character and she seemed to be having the time of her life on stage. There was something sinister about Flotsam played by Jeremy Greenstein and Jetsam played by Levi Kessler. I enjoyed their performances. Max Lianos was a hoot as Chef Louie as the Les Poisson number was very funny! The other Chefs were Max, Mika, Thistle and Keaton. The Princesses were Mirabel Armstrong, Laura Vlahakis, Alyssa Uyeda, Reese Schiffman, Livi Plesent, and Isabel Parra and all had their moments above the sea. The Sea Creatures also provided another layer of realism under the sea. Those acting in that capacity were Mira Saville as the Blowfish, Ayla Moses as Newt, Happy Boosinger as Carp, Cosette Okker as Plaice, Arden Malsin as Bass, Jadyn Plesent as Chub, Ian Warfield as Fluke, Keaton Asma as Sea Horse. The Seaweed Chorus was Mirabel Armstrong, Thistle Boosinger, Joe Call, Garrett DeFaria, Sean DeFaria, Zara Dershowitz, Connor Edwards, Paige Natoli, Isabel Parra, Livi Plesent, Reese Schiffman, Alyssa Uyeda, and Calista Kimura. The actors who provided another layer of realism to the Ursula character were the Tentacles. They were Evyn Armstrong, Zara Dershowitz, Dyllen Nellis, and Socorro Park. Most of the cast member performed different roles on various nights giving everyone another chance to shine in another role. The Backstage Crew, Props Crew, and the Hair & Make-up were up of the cast, crew and parents. Camp Director and Staff: Dolores Aguanno, Zoe Petersen, Christine Barocio, Brandon Blum, Madelyn Ross, Allegra Williams, Jeremy Blum, Maya Sherer, Mika Barocia, Nick Freedson, and Samuel Petersen. It’s no wonder things run as smoothly as they do at dee-Lightful there is a crew and support staff that is second to none! “I don’t like flying. My stomach starts doing strange things. And my body changes in ways you cannot believe. And yet here I was ready to get on a non-stop United flight to Newark, New Jersey. Up until Thursday August 8, 2013, I had never been in New York City. They do things differently in at the Newark airport. Hailing cabs at the airport requires you to punch a machine with information, getting a paper check, and then waiting for a cab to take you to your destination. Our cab driver was Haitian who drove very fast weaving in and out of a rain-slicked road. I gasped a couple of times at the near misses this Thursday night. And the guy on the radio said New York had the fourth best pizza in the nation. The present study examines the emotional and hormonal responses to tango dancing and the specific influences of the presence of music and partner on these responses. Twenty-two tango dancers were assessed within four conditions, in which the presence of music and a dance partner while dancing were varied in a 2 × 2 design. Before each condition and 5 minutes thereafter, participants provided salivary samples for analysis of cortisol and testosterone concentrations and completed the Positive and Negative Affect Schedule. The data suggest that motion with a partner to music has more positive effects on emotional state than motion without music or without a partner. Moreover, decreases of cortisol* concentrations were found with the presence of music, whereas increases of testosterone levels were associated with the presence of a partner. The authors' work gives evidence of short-term positive psychobiological reactions after tango dancing and contributes to understanding the differential influence of music and partner. Jack Viertel, Senior Vice President. Luis Bravo Productions and Jujamcyn Theaters present Luis Bravo’s Forever Tango at the 915-seat Walter Kerr Theatre, playing to packed houses especially with Special Guest Stars Luis Enrique and Dancing With the Stars dancers, Karina Smirnoff & Maksim Chmerkovsky. I saw Mr. Chmerkovsky heading into a restaurant after the matinee performance and I told him “Nice job today!” He said thank you and quickly walked away. The tango originated in the lower-class districts of Buenos Aires, Argentina and Montevideo, Uruguay and is a dance that has influences from European and African cultures. As the red curtain lifted from the stage, the upstage wall was sprinkled with stars and slowly the lights on the orchestra enhanced the setting to view men playing the Bandoneons: Víctor Lavalléen, Carlos Niesi, Jorge Trivisonno and Eduardo Miceli, the sound that makes tango, the tango. Silently, and downstage right, Juan Paulo Horvath appeared to be lifted behind an excessively large Bandoneons on stage and he waited while a beautiful Victoria Galoto joined him in a marvelous opening number, Preludio del Bandoneó y la Noche. I found it fascinating the dances told a story mostly of want, of love, and of revenge. The couples meet, and there is either a fascination or mutual repulsion. Either way, they both are enchanted by the act of dancing, forced or otherwise, and embrace, bringing together the feelings shared between a man and a woman, the beating of two hearts. I especially found this to be true in El Suburbio, a dance of passion, struggle, and want. Juan Paulo Horvath and Victoria Galoto are exceptional dancers and choreographers. They dance so close, the steam from their bodies has little chance to escape, the footwork impeccable and magical sometimes not knowing where the man ends and the woman begins. Marcela Duran and Gaspar Godoy find a way to put so much human emotion in the dance without changing the passion from their esse in the dance Soledad. Mariana Bojanich and Sebastián Ripoll carry a solid strength throughout their dance La Mariposa and Quesjas de Bandoneón. Natalia Turelli and Ariel Manzanares provide a very funny comic turn and certainly was a crowd favorite in their dance of La Tablada and Felicia. Ariel Manzanares has a slight tuff in hair in the center of his scalp gives off the appearance of an accountant after a long day who jumps at the chance to dance with anyone, should she accept. And she seems to accept, very hesitantly. Odd, that he doesn’t take the woman rather he slides into her gently and away they go. I don’t watch television so I didn’t know Karina Smirnoff and Maksim Shmerkovskiy but they were a crowd favorite and the audience enjoy their dance, choreographed by Juan Paulo Horvath and Victoria Galoto. The other remarkable dancers were Soledad Buss & César Peral, Aldana Silveyra & Diego Ortega, “Zumo” Leguizamón & Belén Bartolomé, Florencia Blanco and Hernán Lazart. Luis Enrique provided the singing with the songs Volver, Como Volver a Ser Feliz, Yo No sé Mañana, El Día Que Me Quieras, No mes des La Espalda. Luis Bravo was the creator and director of this fine show and it moved seamlessly from beginning to end. The wonderful music was led by Orchestra Director Víctor Lavellén and the melodious Arrangements & Orchestrations were provided by Lisandro Adrover. Press Representative: O & M Co.
Run and take a friend who loves to tango. “We sat there, near the pond in rural New Jersey – Christine, her mother, and me – relaxing in our quest to observe nature, watching tadpoles and frogs, heads protruding the surface of the water, on this hot summer afternoon. Chris, with her binoculars, spotted something and felt the need to pull up her pant legs and walk into the pond. She paused to see how a baby tree frog was doing and then she pulled it off the wall and observed its progress and took a moment for me to scrutinize. I took it all in with squinting eyes, satisfied, turned my attention to the green algae, and listened to one particular frog whose voice clicked like the classrooms intercoms of the sixties. And then a frog with a long tail crawled up on the ledge and stared at us. He sat there with zombie like eyes and as we approached he was unaware of our presence. He didn’t blink. He didn’t look well. We poked the frog a couple of times. Chris threw some pond water on him and then our attention was diverted. A few moments later that same frog flipped over on its back, showing his white underside, shook his tiny legs a couple of times and died like a possum. But he wasn’t dead, only faking it for the time being and we found that surprisingly odd. The Golden Theatre – A Shubert Organization Theatre, Philip J. Smith, Chairman and Robert E. Wankel, President – presents Vanya and Sonia and Masha and Spike by Christopher Durang and directed by Nicholas Martin. Vanya and Sonia and Masha and Spike is my first Broadway play and one of the finest productions I have ever seen, bar none. The lady sitting in front of me thought I was laughing too much in the first act (she exchanged seats with her date) and crying too much in the second act. But mostly, I was having a great time and I count this as one of the finest, exhilarating theatrical experiences of my life. A play this much fun should not be legal and I was proud to lose my Broadway virginity on this particular night. The setting is Bucks County, Pennsylvania in a traditional country home wonderfully designed by David Korins, the Scenic Designer. And typical of a Chekhov play, two characters are introduced in the opening moments. 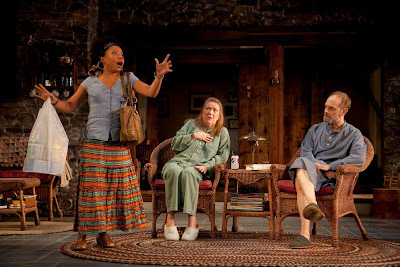 Vanya (David Hyde Pierce) wearing his night shirt, slippers, holding a cup of coffee, and keeping watch for the blue heron at the pond, is joined moments later by Sonia (Kristine Nielsen) in pajamas who is carrying a cup of coffee in one hand and sipping on a diet soda from the other. Sonia is slightly put off that Vanya has already gotten his coffee. But as they watch from their morning room for the blue heron, there’s trouble brewing in paradise. Vanya says he likes the other cup of coffee better and a small Chekhovian battle takes root. It’s not surprising that something is eating at Sonia. 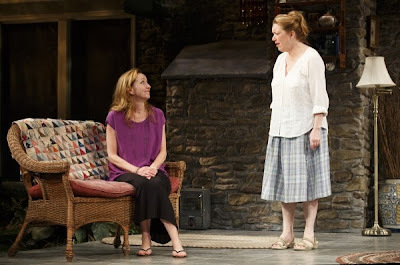 She’s tells Vanya that she’s been having bad dreams about being 52 and unmarried. Eyes focused, they look to the pond hoping to catch a sign of good luck. And like the thunderclap of an unexpected storm, Cassandra (Shalita Grant), the housekeeper, enters and brings warnings of impending doom to the household and the message of doom rolls off the tip of her tongue as she enters the house. But Cassandra can’t leave well enough alone and invokes the name of “Hootie Pie” as she warns them to beware. Vanya and Sonia aren’t terribly concerned - making light of Hootie Pie - but Cassandra says they are in jeopardy of losing the house and she sees them walking to the poor house. Sonia thinks someone will give them a ride. But thinking back on what Cassandra has told them, the two suddenly become Chekhov characters with an unbearable sadness overcoming them. They are sad and talk about losing their cherry orchard - well 10 or 12 trees. Breaking the spell of sadness are cookies, and especially graham crackers that Sonia is so fond of that it invokes the name of their five-time divorced movie star sister, Masha (Julie White). Sonia then remembers to tell Vanya that Masha will be there in about an hour just as her car pulls into the driveway. Vanya, a little perturbed at Sonia’s forgetfulness, runs upstairs to put on his pants. Masha, with her 29 year-old aspiring actor boyfriend Spike (Creed Garnick), makes a grand entrance into the home she owns. She is every bit the movie star. “Sweetest Vanya, dearest Sonia. How I’ve missed you. You both look the same. Older. Sadder. But the same. It’s wonderful to see you, Vanya. Oh, and you too, Sonia. Masha sends Spike out to the car to fetch her Snow White costume and tells them they are all invited to a costume party later that evening. After an exhausting run to the car, Spike sees the pond, strips to his underwear, and races to jump in but not before giving to his beloved a smooch and rustling Vanya’s hair. Egregiously ditsy, Masha wants her siblings to come to the party as her dwarfs an additament to her costume, Grumpy for Vanya and Dopey for Sonia. Neither one likes the idea. Vanya is at least agreeable to going as Doc, but Sonia will only come as the beautiful evil queen before she becomes ugly. In the meantime, Spike is down by the pond and speaking to a young nymph, Nina (Liesel Allen Yeager), and Masha is having a hard time with that. Christopher Durang has written a magnificent play with modern day characters filled with various peculiarities and eccentricities going about the disorderly formality of their lives. But not lost in the metal suffering of the characters is the humanitarian passion about love, respect, family, and caring for one another. This is Durang’s finest work. There are similarities in Durang’s play and Chekhov’s Uncle Vanya. Sonia and Vanya are characters from Uncle Vanya. Each eccentric character hates his or her life (except for all the enticing parts and little pleasures of life). They wake up one day, not knowing where the time has gone, and find they are at risk of losing their home. Durang has his characters at a certain age where everyone has lived long enough to have a strong perspective on his or her view of life. And no one hems or haws anymore; they get right to the point. This all makes for very strong relationships, funny situations, and exciting conflict. And the phone call in the second act is something I will never forget. They are all delightful characters with a strong purpose. David Hyde Pierce plays Vanya who tries his hardest to keep the peace between siblings and live out his life on the farm as a gay man for the remainder of his life without major distractions complicating his life. Unfortunately, he has a price to pay for wishing that on himself during the course of two tumultuous days of the play. Pierce is exceptional in the role. Kristine Nielsen is Sonia and she does things I’ve never seen an actor do in my entire life. And those “things” are part of the whole package that makeup the entire character, the voice, the physical life, the comic timing, the work and craft are not to be believed. And then there is the phone call in the second act when a hush came over the entire audience and near the end men and women openly wept. People talk about the emotional connection one gets at the theatre and this was an exceptional moment in the play. Nielsen is a one of the greatest American actors working on our stage today. Julie White is Masha and she is also one incredible actress. Masha is one wacky chick living her entire life as though she were on a set, being pampered, and adored by every male with a pulse. But she does not see the signs or listens to the right people and it takes every bit of pot banging to ensure she is being noticed. White is extremely funny, slightly confused in character, and very sharp all at the same time. Masha also has a special silent moment on stage, which brought the house down. All in all, White's performance is wonderful. Shalita Grant plays Cassandra the person who picks up the destroyed fragments of other people lives. Seemingly, she is the housekeeper. She is also a psychic who can see into the near future with incredible clarity if only people would believe her. She also has a voodoo doll that she uses to great affect. But most of all, she loves the people she works for and would do anything to keep her job. One can’t help but laugh out loud at her antics. Creed Garnick was Spike on this particular night, the half naked boyfriend to Masha, and did a fine job. But what I particularly nice was his relationship to the cast of characters on stage. Each relationship differed yet all were saucy. Liesel Allen Yeager is Nina a young actress with a lot on the ball. She works her way into the good graces of all the characters but I wonder if her relationship with Spike could have been a little stronger. Yeager was quite good and very believable. Other performers that I did not see on this particular night are Billy Magnussen, Linda Marie Larson, Amelia McClain, Keith Reddin, and Heather Alicia Simms. Nicholas Martin, the Director, has done a marvelous and masterful job. The play pushes all the right buttons and the actors are specific in their choices and movements on stage. There are a lot of moments that you take home with you, that stay with you. This was a night of theatre that I will never forget. Run! Run! Run! It’s playing on Broadway now but when it comes to Los Angeles grab your seats.